Thomas Bell was born about 1876 in Beverley, Yorkshire to painter Johnson Bell and laundress Amy Bell nee Robinson. Thomas was baptised on the 15th of January 1876 in Kilham, Yorkshire. At the time of the 1881 Census, the family lived in Orchard Road, Dorking. Johnson was working as a carpenter and Amy was looking after their children: Beatrice, Martha, Thomas, William, Violet and Alice Maud. At the time of the 1891 Census, Thomas Bell lived with his paternal grandparents, farm worker, Johnson and Sarah Bell at No 1 Fox Cottage, Great Bookham. At this time Thomas was also working as farm worker. 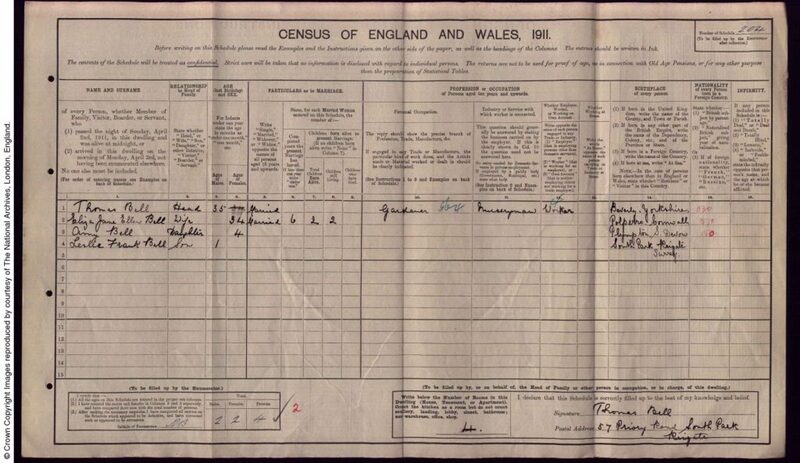 Thomas married Eliza Jane Ellen Good in the 4th quarter of 1904 in the Registration District of St Germans in Cornwall. Eliza was born in 1876 in Liskeard, Cornwall to stone mason Edward, born about 1855 and Ellen born about 1853, both in Cornwall. 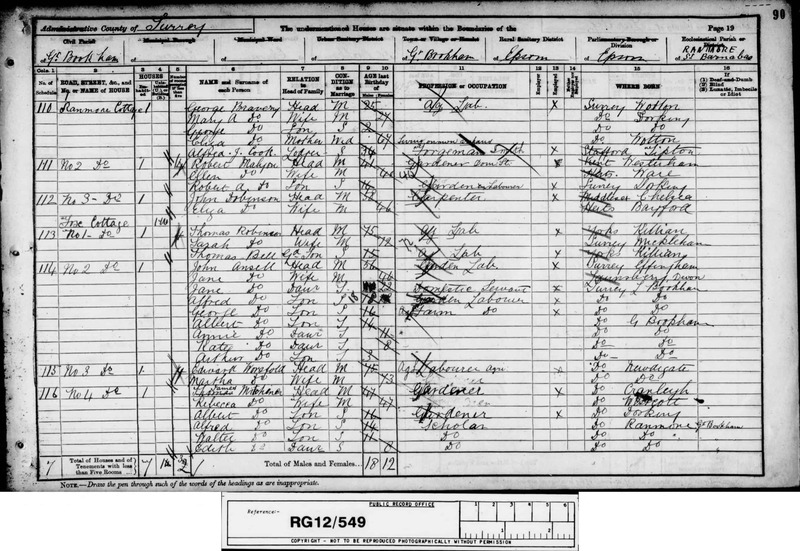 At the time of the 1901 Census, Eliza Jane Ellen was working as a dressmaker. 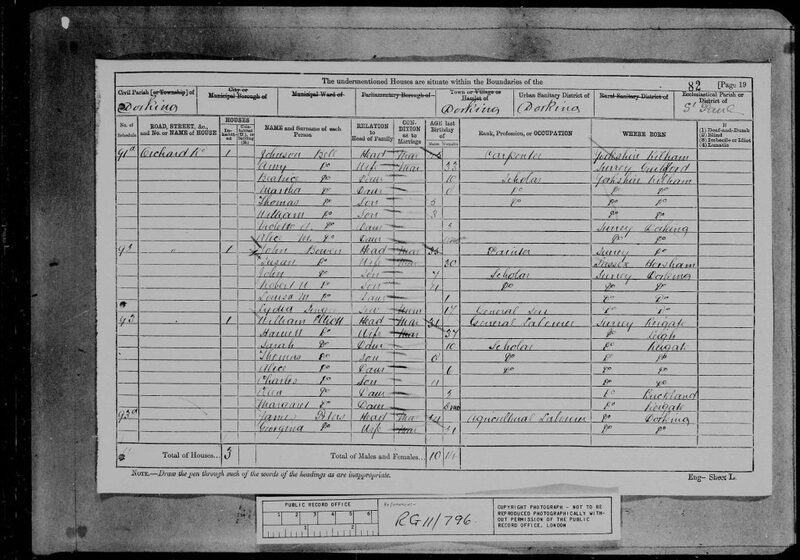 Thomas and Eliza had four children: Amy born about 1907 in Plympton, Devon; Leslie Frank born in 1910; Thomas in 1912 and William born in 1914, all in Reigate, Surrey. At the time of the 1911 Census, the family lived at 75 Priory Road, Reigate. Thomas was working as a gardener and Eliza Jane Ellen was looking after their children: Amy and Leslie Frank. The accommodation had four rooms. Thomas Bell enlisted into the Royal Navy (Royal Fleet Reserve/Devonport/ Class B/645). He was an Able Seaman and his service number was: 196271. At the time of his death he served on HMS Tornado. Thomas Bell was killed by a mine explosion on board of HMS Tornado on the 23rd of December 1917 in North Sea. His body was never recovered for burial. Thomas Bell is commemorated on the Plymouth Naval Memorial, on Panel Reference 21. He received the British War and Victory medals and the Star. His wife Eliza Jane Ellen Bell later lived at 4 White Horse Cottages, Dorking, Surrey. Thomas’ father Johnson was born about 1833 in Kilham to labourer Francis and Martha. Johnson was baptised on the 17th of November 1833 in Kilham. His mother Amy Robinson was born about 1846 in Guildford to agricultural labourer Thomas, born about 1818 in Kilham and Sarah, born about 1819 in Mickleham. Johnson and Amy married in 1871 in Bridlington, Yorkshire. 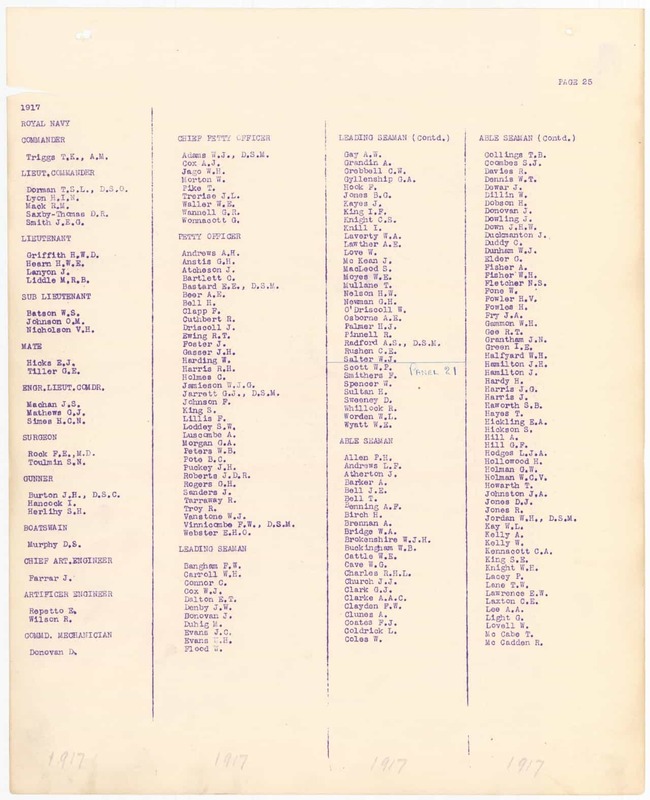 Thomas had nine siblings of whom seven are known: Beatrice born about 1871; Martha born about 1873; William born about 1878, all in Kilham, Yorkshire. Violet A. born about 1879; Alice Maud born about 1881; Frank born about 1882 and Annie A. born about 1884, all in Dorking, Surrey. At the time of the 1891 Census, Thomas’ parents, Johnson and Amy Bell were still at 43 Orchard Road. The household further comprised of their children: mothers help Martha, errand boy William, Violet, Alice Maud, Frank and Annie. At the time of the 1901 Census, Thomas’ family lived at 43 Orchard Road, Dorking, Surrey. Johnson Bell was working as a carpenter and his wife Amy was a laundress. The household further comprised of their children: ironer Alice Maud and nursemaid Annie. At the time of the 1911 Census, Thomas’ parents, laundry man Johnson Bell and laundress Amy Bell lived at Red Lion Cottages in Dorking. The household further comprised of their grandson, errand boy, Frank Smith. Amy stated that she had given birth to ten children of whom seven were still alive. The accommodation had four rooms.